Luke Akehurst of ‘We Believe in Israel’ has been circulating an amended version of the IHRA definition of antisemitism to Local Authorities and encouraging them to adopt it. A letter sent by Akehurst, former Labour Leader of Hackney Council and failed NEC candidate, has been urging councils to pass a motion that subtly, but significantly, toughens the suppression of pro-Palestinian voices. Worse it tries to pass off this new version as the same as the original. The letter has been circulated in the name of a previously unknown front organisation ‘Local Government Friends of Israel’. This makes criticism of Israel such as “Denying the Jewish people their right to self-determination, e.g., by claiming that the existence of a State of Israel is a racist endeavor.” an absolute offence; regardless of whether there is any evidence of antisemitic intent. We are faced with an increasing onslaught on criticism of Israel with attempts being made to drawn the lines ever more narrowly. There are accusations that any singling out of Israel is antisemitic: so, for example, calling for boycott, divestment and sanctions in Israel’s case but not in others is prima facie evidence of antisemitism, as is using the word apartheid to characterise any aspect of Israeli society. What I would like to address here is the use of the concept of ‘apartheid’ to compare South African and Israeli society, and the dangerous suppression involved in outlawing its use. Critics say the analogy is plain wrong and therefore its use can only be malign: an attempt to delegitimate, demonise and apply double standards (to use Sharansky’s 3-D test of criticism of Israel – see the discussion Is criticism of Israel antisemitic?) about what it is that goes beyond what is acceptable. Ultimately, for many of these critics, the use of the term “apartheid” is antisemitic. First, let me begin by saying that anti-Semitism in itself is certainly not a hoax. There are centuries of evidence supporting the existence of virulent Jew-hatred. Anyone with a Twitter account knows that such anti-Semitism exists. I’ve recently highlighted it at Mint Press News, a publication to which I contributed for over a year. So anti-Semitism, though largely an enterprise of the far-right, exists on the left as well. Fighting anti-Semitism is a laudable goal. But here’s where I part company with the institutional Jewish community. If you were to poll Jews about their priorities in life and issues that most concern them, anti-Semitism would be very far down the list. Of course, members of all religions react with great concern to threats to their co-religionists. That is understandable. But Jews aren’t the only religion under threat: true, Jews have been attacked by Islamists in Europe and places like Turkey. But Coptic Christians were attacked by ISIS in Egypt this week and Rohingya Muslims have been ethnically cleansed by Burmese Buddhists for several years. Jews in today’s world don’t have a monopoly on victimhood. But the organized Jewish community acts as if it does. As if they own the field of religious hatred and are the only victims, or at least the only ones who really matter, because of our past suffering in the Holocaust. Exaggerating the significance of anti-Semitism also tends to distort Jewish life and identity. If you define yourself as a Jew as someone fighting against anti-Semitism, rather than fighting for a rich, positive, substantive Jewish identity–you don’t have much substance on which to base your Jewishness. That’s a significant part of my quarrel with groups like the ADL and AJC, whose existence and financial wherewithal is predicated on anti-Semitism. Jews obsessed with anti-Semitism do offer what they see as a positive model of Jewish identity: Israel. I wrote about this in the essay, The Closing of the American Jewish Mind, my contribution to the newly published Israel and Palestine: Alternative Models of Statehood. There I noted that Israel has become a substitute for the Jewish culture, traditions, art, and even religious practice that used to be at the heart of Diaspora Jewry. Wealthy Jews like Sheldon Adelson, Michael Steinhardt and others have bet hundreds of millions of dollars that while Judaism may wither on the vine, Israel will not. That’s why they’ve funded Birthright as their primary response to assimilation. But what happened to Torah, Talmud, religious ritual, Biblical prophecy, Kabbalah, Zohar, Yiddish culture, language, and song, among many others? If you posit anti-Semitism and Israel as the sole arbiters of Jewishness, it leaves nothing of what sustained us over centuries and even millenia. It is a poor substitute for what we’re losing. And I can’t say that I blame any Jewish youth who rejects this tepid porridge they’re offered as a substitute for Jewishness. This also explains why the Pew poll found that the younger generation is rejecting their parents’ generation and its single-minded near-obsession with Israel to the exclusion of almost all else. It goes without saying that if you offer Israel as the New Jewish Religion, that you view any threat to Israel as a threat to the Jewish people. That is why the Israel Lobby has worked so diligently to insinuate criticism of Israel as a primary tenet of anti-Semitism. That is why the current far-right Israeli government repeats the smear that BDS is not just anti-Israel, but anti-Semitic. These are, of course, radical revisions of the traditional definition of anti-Semitism as expression of hatred toward Jews. If you believe there is no difference between Israel and Jews, then this may make some sense. But if you conflate the two then you fall into a morass of internal contradictions. If you reject the notion of dual loyalty, then how do you combat the claim by anti-Semites that Diaspora Jews must be disloyal to their homelands because they retain sole loyalty to Israel? How do you stand against acts of terror by Islamists aimed at Jews, when the terrorists believe that in attacking Jews they are also attacking Israel? How do you embrace the claim by the Likudist far-right that Iran aims to destroy not just Israel, but the entire Jewish people? Especially when the Iranians have never made such a sweeping claim? Few will have any argument with the first two definitions, but the second two are so vague and broad as to be meaningless. Under this problematic rubric, reporting that Israeli Jews kill Muslims because of their religion is anti-Semitic. Criticizing Israel for fomenting political discord in the Middle East also appears anti-Semitic. And criticizing Israel before criticizing every other democracy which engages in bad behavior is also anti-Semitic. In fact, such an approach makes most Jews themselves anti-Semites because most American Jews are critical, some highly critical of Israel and its policies. Such definitions have one major goal: to silence, rather clumsily, political speech regarding Israel. They are intended to “box in” the BDS movement and other forms of “delegitimization” by defining legitimate political discourse as off-limits. Such efforts must be seen for what they are: bald-faced attempts to stifle debate and suppress dissent. Democracies are antithetical to such notions. They are strong precisely because they permit, even encourage the free flow of ideas. That is how the best ideas develop and how we keep such societies strong and vital. Suppressing speech, as the Israel Lobby seeks, is anti-American and anti-democratic. …The British government hopes the new definition will offer a more concrete and clearer notion of anti-Semitism, to be adopted in as many circles as possible. Proponents believe that the clarified definition will prevent vagueness that may lead to anti-Semitic crimes going unreported or unacknowledged. The definition is part of an international effort to end hate crimes against Jewish people as well as combat Holocaust denial in all its forms. These examples themselves are deeply problematic. The State of Israel is racist. It’s policies are racist. The structure of its society is racist. By noting and criticizing such racism prevalent in Israeli society I by no means “deny Jewish people their right to self-determination.” In fact, I strengthen Israel in doing so. The “double standard” theory is bogus as well. Holding Israel to the standards of international law is not “applying a double standard.” In fact, the three main demands of BDS (ending Occupation, return of Palestinian exiles, and offering fully equality to Israeli Palestinians) derive from the heart of democratic traditions. As for the “Nazi analogy,” I’d be a lot more comfortable with this one if the Israel Lobby wasn’t so free and easy to call Israel’s critics and opponents Nazis and the like. Not to mention that there are clear elements of Israeli policy that echo those of the Nazis, just as there are elements of Trumpism which do so as well. Why should the former be labelled anti-Semitic? A clear, carefully articulated analogy based on historical facts cannot be. Finally, you can’t call “holding Jews collectively responsible for the actions of Israel” anti-Semitic if Israel’s leaders themselves refuse to make such a distinction. You can’t have your cake and eat it. These efforts to redefine anti-Semitism for the convenience of the Lobby and as a buttress against criticism of the noxious polices of the State of Israel are worse than a waste of time. They are a radical departure from established consensus both among moral philosophers, historians and Jews themselves about the definition of the noxious concept of Jew-hatred. We are about to see such a radical departure from consensus here in the United States as Donald Trump takes office. It will lead to great ugliness and distortion of the great traditions of American democracy. Let’s not do the same to the concept of anti-Semitism. Will using an image like this, or commenting on its resonance to the Nazi regime, be outlawed? Were the definition to stop at that point its adoption by the Government could be applauded. But the major part of the definition is given over to examples of actions that should be investigated as purported to show antisemitic motivation. Of the eleven examples given, seven relate not to Jews as Jews, but to the state of Israel and its actions. This emphasis reveals the motivation of those who have been promoting this definition for more than 10 years. It will be all too easy for governments, or others via litigation, ‘lawfare’, to employ it to limit criticism both of: Israel’s repeated breaches of International Law and abuses of the Human Rights of Palestinians; and critiques of Zionism as an ideology used to justify and excuse Israel’s actions. There are already many examples of attempts to illegitimately stretch the use of the definition to censor legitimate political and moral debate. A particular target has been the non-violent Boycott, Divestment and Sanctions movement – a mass non-violent civil society campaign to hold Israel to account. Already Israel’s UK supporters have rushed to pre-emptively interpret the Government’s announcement as shielding Israel and its foundational political philosophy of Zionism, rather than protecting Jews. There is a simple option for the Government that will allay fears that this definition will be used to suppress free speech. This is to adopt just the 40-word definition cited above, but not the contentious, partisan, politically slanted examples that accompany it. Free Speech on Israel also urges the Government to adopt an equivalent definition of Islamophobia and promote it vigorously since attacks on Muslims, both verbal and physical, are a far greater and more frequent threat to the safety and security of British citizens and residents than is antisemitism. 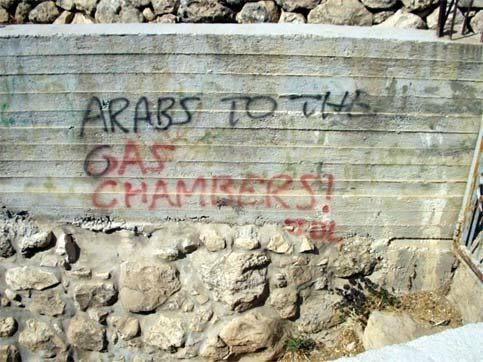 Free Speech on Israel is a network of labour, green and trade union activists in the UK, mainly Jewish, who came together in April 2016 to counter attempts by pro-Israel right wingers to brand the campaign for justice for Palestinians as antisemitic. Their attacks form part of two highly orchestrated campaigns: one, to undermine the Labour Party led by Jeremy Corbyn, the first potential British Prime Minister to have a consistent record of supporting Palestinian rights; the other, to suppress the pro-Palestinian voices of Jews, Muslims, Christians, and others of many faiths and none, campaigning for freedom, justice and equality for all. 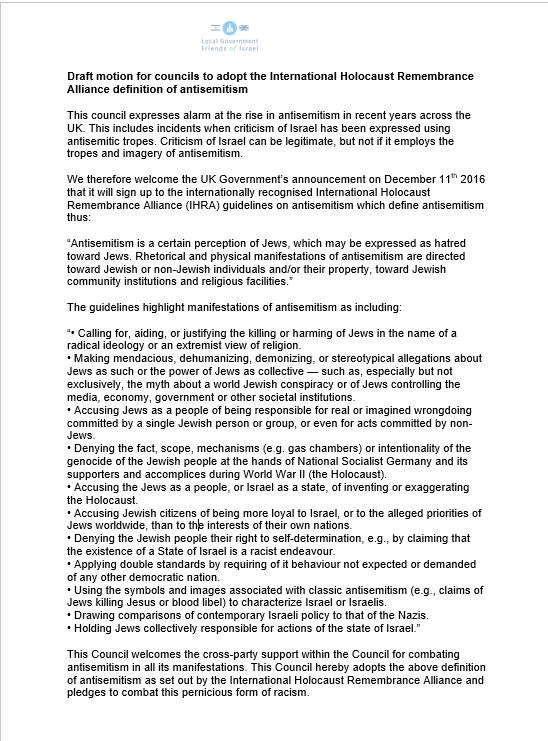 The IHRA definition of antisemitism is at https://www.holocaustremembrance.com/sites/default/files/press_release_document_antisemitism.pdf . It is virtually identical with the 2005 ‘EUMC working definition of antisemitism’ which according to an expert report to a Parliamentary inquiry “rapidly became a topic of controversy rather than consensus….. [and has] largely has fallen out of favour”. Kenneth Stern, the lead author of the EUMC definition has roundly condemned its use to limit debate in the United States. Oxford University philosopher Brian Klug has proposed a more straightforward and easier to apply definition of antisemitism as: ‘a form of hostility towards Jews as Jews, in which Jews are perceived as something other than what they are.’ Use of Dr Klug’s definition was recommended by Professor David Feldman, Director of the Pears Institute for the Study of Antisemitism in his report commissioned to assist the All-Party Parliamentary Inquiry Into Anti-Semitism. The Boycott Divestment and Sanctions campaign was launched by Palestinian civil society organisations in 2005 and has attracted worldwide support. It is the object of concerted attack by the Israeli Government and its supporters in other countries. The International Holocaust Remembrance Alliance is not a formal international organisation. It is a loose alliance whose founding purpose is to ensure, through education, that new generations are informed about that tragedy. This can be seen as an additional problem to the ambiguity introduced into the IHRA working definition by the use of the word ‘may’. It is not antisemitic to hold the Israeli Government to the same standards as other liberal democracies, or to take a particular interest in the Israeli Government’s policies or actions, without additional evidence to suggest antisemitic intent. The methodology of providing a loose ‘working definition’ and then seeking to restrict that definition by listing exceptions is fundamentally flawed. In this instance the HACSC is doubly flawed because it attempts to define antisemitism circularly in terms of antisemitism. The suggested modifications in no way bear on the general issue of subjectivity in interpreting antisemitic statements. This is subsequent borne out by the way the HACSC report completely acknowledges the term ‘Zionism’ as a political concept worthy of discussion and yet goes on to be completely persuaded by personal testimonies alone that the word ‘Zionist’, and by extension its contraction ‘Zio’, has such “toxicity” that it can automatically be assumed to antisemitic. The report avoids explicitly falling into this fallacy, but by subsequently siding with the aggrieved John Mann MP at the hostility and “vilification” he received, the conclusion can be in no doubt. The report singularly fails to remain objective by making this arbitrary determination. The report fails to take account of the fundamental right to freedom of speech. This right cannot be arbitrarily interfered with. Thus the HACSC is legally duty bound to provide a suitable and necessary principle that would differentiate the term of abuse, of say, “Trot”, as directed toward left wing members of the labour party with that of ‘Zio’ for the political backing of Israeli policy. 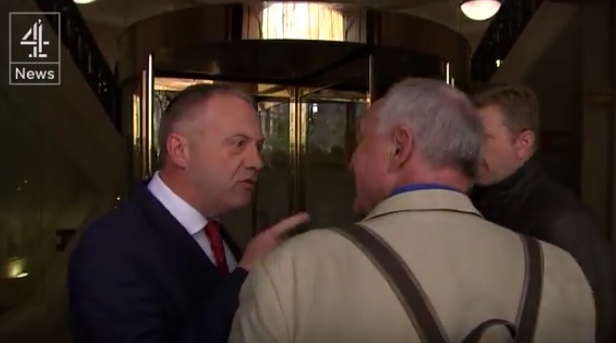 The Select Committee report highlights the angry tweets received by John Mann MP and seems to imply the obviousness of their antisemitic guilt. At least half of those many texts have no discernible racist element by lack of generality. No effort is made to show how any of the tweets are in fact antisemitic in terms of the proposed definition. Merely presenting them in their hostility is hoped to bring your nodding acquiescence along, under an already prejudiced definition. The reader is not reminded of the context of these written messages in which Mr Mann himself appeared to be on the verge of physically assaulting Ken Livingstone in the most insane political moment I can think of in recent times. The Chair of the HACSC report, the conservative’s Mr Loughton MP, attempts to mock Baroness Chakrabarti’s report for describing some antisemitic complaints as “unhappy incidents” and yet his report cites Mr Mann as a victim of vilification “after his attempts to challenge Ken Livingstone’s comments”. Comments which have not been found to be antisemitic at the time of writing and not likely to in this author’s opinion. On the contrary it would seem a likely justice if Mr Livingstone was to prosecute Mr Mann for his gross inappropriate actions and false accusations. The Baroness was quite right to defend her own report’s impartiality in not delving into ongoing investigations and taking sides. Words Mr Loughton ought to let sink in. The report is an abuse of process and should bring professional sanction because of its clear lack of impartiality. This would go some way to safeguarding future parliamentary Select Committee reports. It seems a convenience for this MP and to other vested interests to show the political language of so many in such a tainted ‘working’ definition.